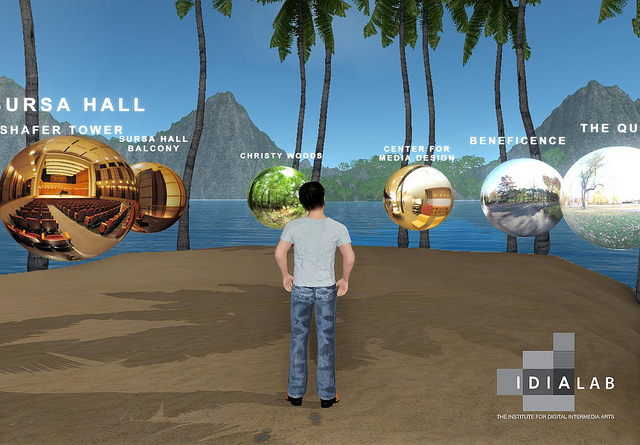 Ball State University’s Institute for Digital Intermedia Arts (IDIA) announced today the release of IDIA Lab City, a new immersive learning experience powered by Blue Mars, Avatar Reality’s 3D social world platform. Visitors to the new area can virtually tour and examine stunning, realistic recreations of artifacts and artworks in their original historical contexts, including sculptures at the 1915 Panama-Pacific International Exposition in San Francisco and a IDIA’s premiere effort in Blue Mars showcases several examples of recent grant supported research projects. For example, students in IDIA’s Immersive Seminar in Virtual Worlds 3D laser-scanned sculptures in Ball State University’s Museum of Art collection, resulting in accurate and detailed replicas in IDIA’s simulation. IDIA director John Fillwalk, also an associate professor of art at Ball State, believes that these new efforts in Blue Mars are also an excellent example of the university’s Emerging Media Initiative (EMI) and its focus on accelerating economic benefits to the state of Indiana through technology transfer and the preparation of increasingly media-savvy human capital. “Part of our mission at IDIA is to develop new technology solutions for our expanding range of clients that are interested in engaging next generation media design, to the economic benefit of both the state and the university,” said Fillwalk. With Blue Mars still in its beta phase, IDIA is exploring various new ways that the platform might be used, from learning and the arts to gaming. Future IDIA initiatives in Blue Mars will include the design of immersive artworks, shared media collaboration tools and the development of an open virtual campus for use by educators interested in engaging the platform as an environment for learning. 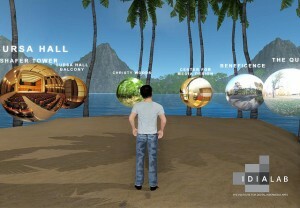 The premiere projects can be viewed by downloading Blue Mars for free at http://www.bluemars.com/. There will be an in-world meet and greet tour with IDIA staff held in IDIA Lab in Blue Mars on Tuesday November 23, 2010 at 2 PM PDT. All are welcome!